Lately I've had a sweet tooth. 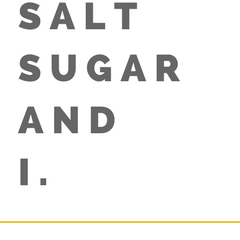 If you're a regular reader you'll probably realise that there are more savoury recipes than sweet but recently I have found my love for everything sweet again. Chocolate cream pie for two? yes please. I first realised chocolate cream pie was actually a thing was while watching one of my all time favourite movies 'Julie and Julia'. Instantly I felt a connection with Julie Powell but to be honest had no clue who she was until I saw the movie. Once seeing the movie I went out and bought Julia Child's 'Mastering the Art of French Cooking' and read Julie Powell's blog starting from the very beginning when she first started her project of cooking through the famous cookbook. If you haven't seen this movie... shame on you. Go out and hire a copy now but make sure you watch it while eating food. Now not popcorn or ice cream food. Make yourself a feast and sit down and watch it because this movie will make you HUNGRY! I am not kidding. I always watch it with food and then have to pause it to go and find more food to eat. "After a day when nothing is sure, and when I say nothing I mean, nothing, you can come home and absolutely know that if you add egg yolks to chocolate and sugar and milk, it will get thick. It's such a comfort." Ever since then Chocolate Cream Pie has been on my mind. Yes I realise that this was about 5 (maybe 6) years ago and I am only making it now. But to be honest I have never found a recipe that I truly wanted to make. Yeh yeh there are probably hundreds out there and if you are from America you have probably stopped reading but Chocolate Cream Pie is not common here in Australia. I googled recipe after recipe for one that tickled my fancy and I even downloaded a virus on my work computer by clicking on a not so trust worthy link (a story too inappropriate for this blog) and eventually gave up. Until I saw this on Bon Appetempt's youtube channel. I was hooked again on the idea of this pie. That it can fix anything. If it can fix Julie's terrible day and also look this fun and easy to make... then why am I still only dreaming about this and haven't made it yet? A couple of weekends ago this all changed. My world changed. I made Chocolate Cream Pie. And it was FRICKIN' AMAZING! It was a shame that only Tristan and I were there to eat it... haha not. Give it a go seriously. Your world will be changed as well. I don't think there are words to describe how amazing this pie is. I can't do it justice so just go out and buy the ingredients and make it. Make it after a terrible day at work, or for friends coming over for dinner or just for the one you love on a rainy night because really you don't need an excuse to make this. Recipe found here on Amelia Morris's blog Bon Appetempt adapted from Jeanna Kelly's cookbook 'Salad for Dinner' (the only dessert recipe in the book). - Preheat the oven your to 375F or 190C and butter a 9-inch pie dish. - Combine the flour, chopped almonds, sugar, sifted cocoa powder and salt in a medium bowl. Using a fork, stir in the melted butter until the mixture resembles moist sand. - Press the dough firmly and evenly over the bottom and up the sides of the pie dish. - Bake the crust until just browned at the edges, about 11 minutes or until it starts to smell like rich chocolate. - Let the crust cool completely before filling it. - In a large saucepan, combine the sugar, cornflour, sifted cocoa powder and salt and whisk to combine. - Beat in the egg yolks then gradually whisk in the milk. - Whisk the filling over medium-high heat until the mixture thickens and continue to whisk and let it bubble for about 1 minute to make sure you cook the cornflour out. - Remove the filling from the heat and immediately stir in the chopped chocolate, whisking until the chocolate melts and the filling is smooth. Stir in the rum (or vanilla). - Pour the filling into the cooled crust and smooth the top. Place a layer of clingfilm over the top (touching the filling) to stop getting a skin. - Let the pie cool to room temperature and then chill the pie until cold, at least 2 hours or overnight. - Whisk the cream, sugar, and vanilla in a large bowl until firm peaks form. - Spread the topping over the pie, sprinkle with some extra grated dark chocolate (optional) and serve. This long weekend has been 4 days of being a hermit inside and lots and lots of eating. Even though the shops were closed most of the weekend it hasn't stopped me cooking and eating... as I write this there is a chocolate pie chilling in the fridge, waiting to be dressed in vanilla whipped cream (blog post to come soon). It's been a rainy weekend and all I felt like was comfort food. At about 7 o'clock last night, I decided I wanted dessert. But on Thursday night after work when everyone was raiding the local supermarket before the long weekend like they were stocking up for a zombie apocalypse I avoided the shops. This meant I was stuck with what was in my cupboard until they reopened which was the basics of basics. So what do you do with fruit that is over ripe, the scrapings of the butter, some sugar, flour and oats? Make a crumble of course!!! So rich and decadent for such simple ingredients and I got to use my new little pots. 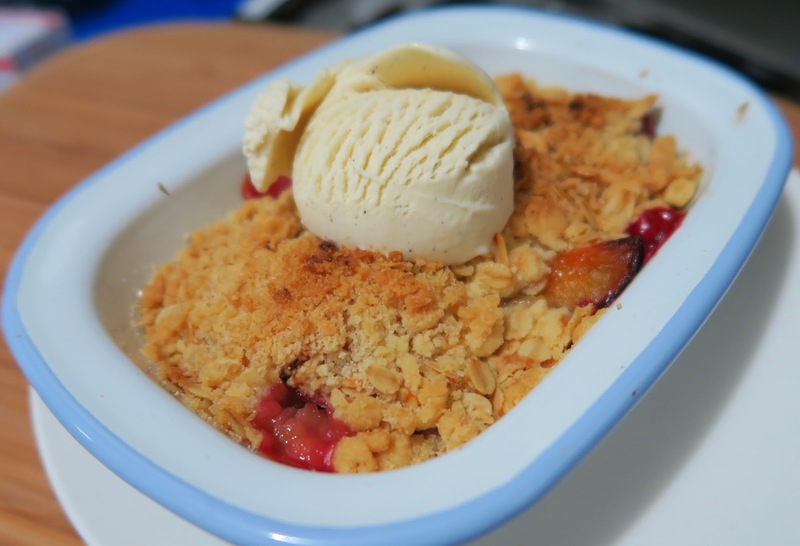 I adapted Nigella Lawson's recipe 'Jumble-berry crumble' from Nigella Express but used plums instead of berries. There was probably an excessive amount of crumble on top for two and could have been split over 3 ramekins but it was still the long weekend so why not indulge and over eat?! (I am sure next week I will crave salad, salad and more salad). This dessert is also great to prepare in advance for dinner guests. Just bung it in the oven about 40 minutes before you want to eat dessert. 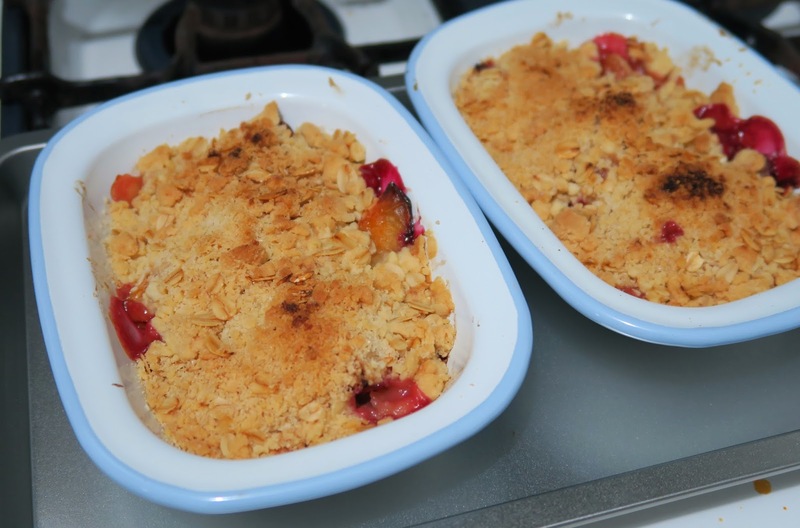 It's super simple too, all I did was cut the plums into wedges and divide them between the ramekins, mix them with 1 teaspoon of raw sugar then top with the crumble mix. 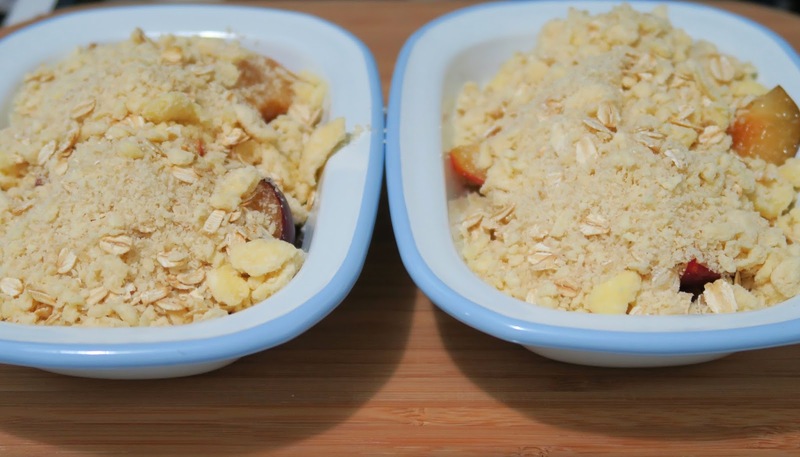 You can also freeze the crumble mix in zip-lock bags (if you make too much or want to double the recipe) so you have crumble in seconds next time. You can also substitute the plums for different fruit or a combination of fruits. Apple and plum is a delicious combo! I hope this simple but indulgent recipe satisfies your craving for comfort desserts on a rainy night in or impresses some dinner guests. Serve with some good quality vanilla ice cream and you can't go wrong! ps. 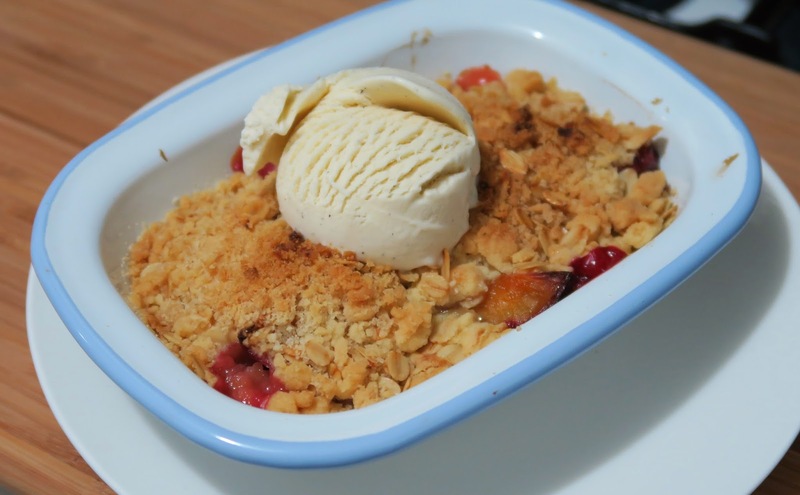 I'm pretty sure I could have bribed the zombies with this crumble and would have definitely survived the apocalypse. 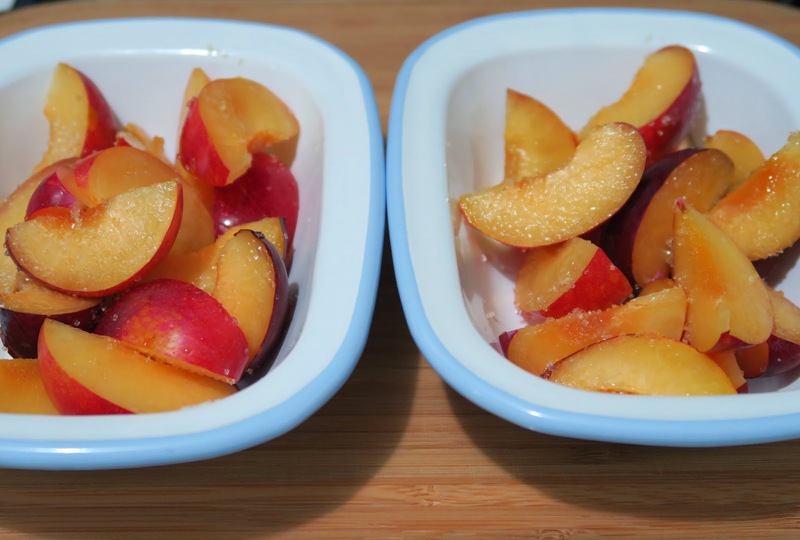 - Place the fruit into two ramekins then mix one teaspoon of sugar into each. Set aside. - For the crumble mixture; place the flour and baking powder in a bowl and rub in the diced butter using you're finger tips until you have a lumpy sand texture. Stir in the oats and sugar until combined then divide the mixture on top of the two ramekins. - Bake in a 180C or 350F pre-heated oven for about 30-40 minutes or until the fruit starts to bubble at the edges and golden on top. - Serve with some good quality vanilla ice-cream. Enjoy.